Note: The “best of Netflix” tag will be used to mark films that at the date of the post’s publication are streaming on Netflix. The films chosen should be of particular interest to filmmakers and writers for their aesthetic and/or narrative contributions to storytelling. 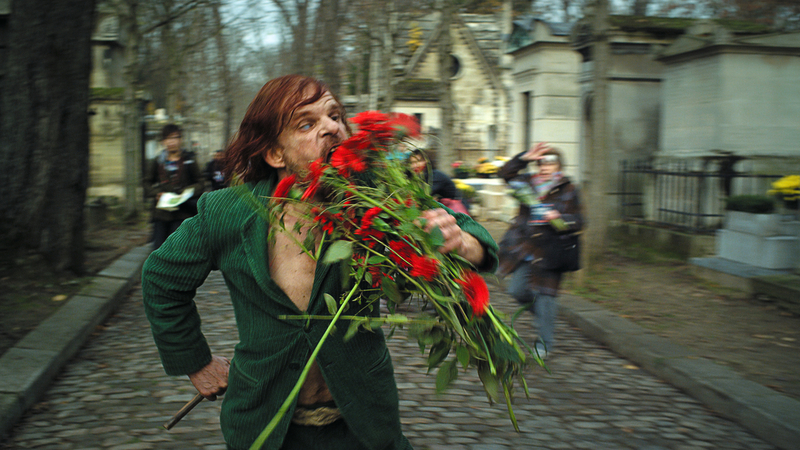 Leos Carax’s Holy Motors is a maddening, refreshing, and genre breaking film. It somehow escapes narrative film convention while still, in its elliptical way, telling a story. It is courageous filmmaking. While some of the best movies I have recently seen polished cinematic techniques to achieve their success, Carax’s 2012 “monsterpiece” without a doubt does something new to secure its spot in cinema history. Holy Motors innovates through nostalgia, a yearning for a time when the “cameras were heavier than us” and film was powered by curiosity, celluloid, and sense of magic—not formulas. Holy Motors opens with movie theater filled with sleeping audiences. Here we see ourselves and the modern state of film; we are bored, but yet we show up. Soon after we are introduced to the protagonist, Monsieur Oscar, seemingly an actor who works and subsequently lives from a limousine. He (played by Denis Lavant) is chauffeured from “appointment” to “appointment”, donning disparate roles as he goes and melting the film’s reality and fiction into one. Our gut reaction is to take this vignettes and attribute each scene with some higher symbolism in order to abate our anxiety of meaning. It wasn’t until a quarter of the way through that I realized that the happening of the films could easily make sense if perceived as a near dystopian future. Holy Motors shows us a world where the cameras have grown so small that even the presence of a director has all but disappeared. From this perspective, a confounding film becomes rich in its thematic reach—commenting on the state of film and beyond. It’s more about defamiliarizing the familiar than leaving viewers confounded. Carax is saying, “Don’t overthink it. There’s still a cohesive world, characters, a story here. Remember cinema can speak in more than one language (read: Hollywood conventions).” The artform has become so saturated with a desire to make things as real as possible that we forgot that film is poetic by its very nature. Here we are reminded. Although Carax resists the notion, Holy Motors is a film about cinema of course, but it’s more so a film about a society whose conditions lead to art being manufactured. Like all great sci-fi, and sc-fi this is, Holy Motors uses its otherworld to discuss our present world. The parable at work here is about an existence where digitization and the virtual take over not just in filmmaking but our personal lives. Just as Carax himself was forced to make a digital film, everyday technologies are imposed upon on us by a larger system. Technologies very production imply an unconsented participation. Yet in this pessimism Carax manages to express tones that range from melancholy to joy. Holy Motors’ heart, creative energy, and sardonic sadness imprint your mind with an oneiric memory like a vivid dream you’re still trying to make sense of days later. In English, it’s a memorable movie, regardless of how its mysteries infuriate and toy with you. 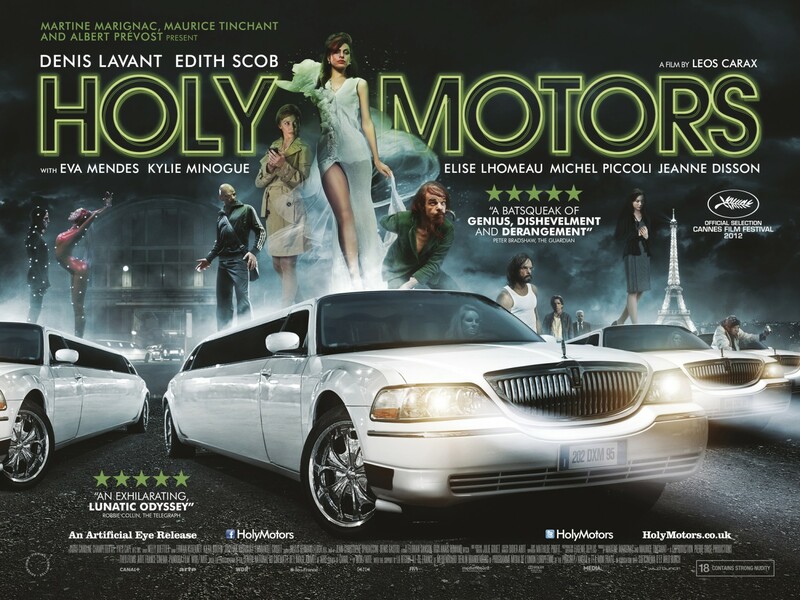 It’s not a film that I can wholly recommend to anyone that does not have the patience for the experimental and “artsy.” But it is a film that I wish everyone would watch because Holy Motors is landmark in the medium; there’s the movies before Carax’s feral film and the movies after. Holy Motors in many ways is reminiscent of Pier Paolo Pasolini’s work: Dreamlike and confounding but with an air of intent that keeps us mulling. Most likely it’s unlike anything you have ever watched and for that we should be thankful. In 1895, one of the first films ever was released by the French pioneers, the Lumière brothers. The myth that surrounds L’arrivée d’un train en gare de La Ciotat (The Arrival of a Train at La Ciotat Station, Arrival of a Train at La Ciotat) is probably more discussed than the 50 second film itself. The legend being that when it first premiered audiences were struck with terror. While accounts that some viewers ran from the moving image are dubious, the fact that the footage was powerfully visceral is clear. It’s moments like this, “A Trip to the Moon”, the addition of sound, color, Citizen Kane (non-chronological narrative relying on flashbacks and multiple perspectives), etc. that surprised and mesmerized, making the medium young again. Holy Motor if just for a moment revitalizes movie making and storytelling, showing us that there are still new ways to film.